Reduce frizz while retaining hair's style with this great quality diffuser. 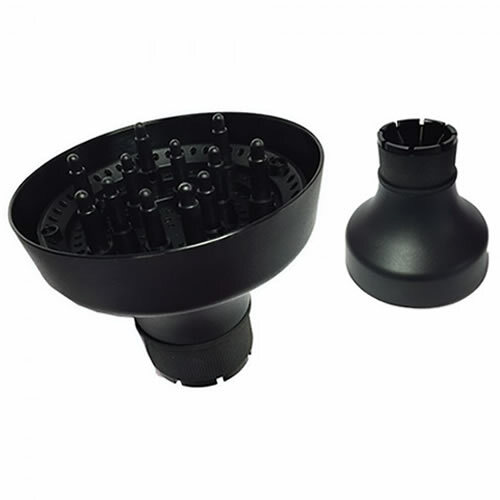 The Hair Tools Volumax Airflow Diffuser features an airflow rotational fan blade to aid in reducing frizz. It has a high heat-resistant silicone adaptor that adapts to fit most hairdryers (including all Parlux models except Parlux 3500). A top quality additional tool for your hairdryer to better manage clients' hair, it provides a gentle drying effect that leaves styles intact. 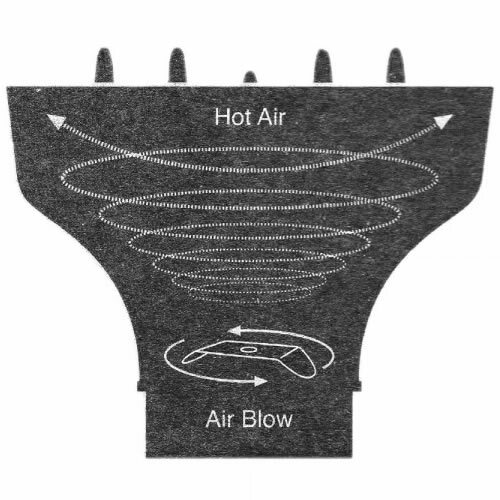 Please see the additional picture showing a cross section of the the diffuser's action. An ergonomic shape, for comfort and reduced hand-tiredness, encloses 1200 watts of drying power controlled via 2 speed and 4 temperature settings. Great value, 1700-watt dryer with 4 temperature and 2 speed controls and a 3-metre cord. Comes in black and is supplied with 2 nozzles. 1760-watt dryer with an ergonomic handle for superb comfort, 4 temperature and 2 speed settings and a coldshot button. Cool black dryer with 1810-watt motor for ultra-rapid drying controlled by 2 speed and 4 temperature settings. Winner InStyle Best Beauty Buys 2010 for best hair dryer. Professional performance in a 1900-watt, stylish compact package. Comes in 9 colours: Black, Black Ceramic & Ionic, Silver, Purple Haze, Chocolate Spice, Raunchy Red, Fuchsia, White Flowers and Black Flowers. Also available in a very special Ceramic & Ionic edition. Great value professional dryer with a 1300-watt motor, 2 speeds and 4 temperature settings. It's fitted with a 3-metre-long cable and the glossy black casing is impact resistant.